The Rochelle Brushed Steel Bar Stool Black is a striking item, a mix of the retro and the modern in a stylish and functional package. Delivering chair-like comfort straight to your bar area, the Rochelle is a breathtaking model that will enhance its location. The seat is well padded with high density foam for comfort and is clad in black faux leather for a luxurious touch, covering the entire seat including the tall, supportive backrest. The surface is stitched in to a quilted pattern that accentuates the padding below and gives a look reminiscent of a retro smoking chair, adding a touch of opulence. The brushed steel plated frame below houses a gas lift mechanism which allows you to raise or lower the seat and spin through 360 degrees for easy access, with a strategically placed footrest on the central column adding further desirability. A round base keeps the Rochelle stable and sturdy, whilst also coming with a rubber floor guard beneath to help keep your floors free from scratches. "Great price great design and so comfortable love them"
I am very pleased with the 3 stools l purchased they fit in extremely well. l especially like the brushed steel as it is less bling than the chrome. It has been stated to me that the black seat material actually looks like leather. I suffer from a very bad back so comfort important.. they are amazingly comfortable, easy to get on and off. Very good quality and efficient delivery. Great price great design and so comfortable loved them. 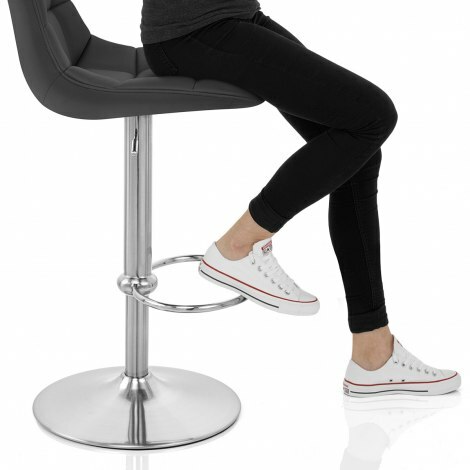 Great stools as a family member has them also super quick delivery and easy to assemble best home bar stools I have sat on. Bought to replace some old ones that had seen better days! The Rochelle stool is so comfortable and they compliment our kitchen beautifully, hopefully brushed steel will fair better than chrome. Highly recommend these gorgeous stools, style comfort they have it all.